We gave this chart on the best gifts for guitarists a complete overhaul, adding several new items that would make great presents. These additions include both functional options such as the Elagon Pro Care Guitar Bundle and the Pick Geek Pick Set, along with some fun gifts including the Marshall 3.2 Compact Bar Fridge and a Bamboo Guitar Neck Kitchen Utensil Set. Whether it’s a birthday, Father’s Day or Christmas, buying a gift for the guitarist in your life can be a tricky task – especially if you don’t play the instrument yourself. Thankfully, the world of guitar is awash with potential ideas, from strings and capos to a couple of useful novelty items that would put a smile on the face of any guitar enthusiast. After trawling the current market, we narrowed our choices down to 15 solid options, which are on show in the chart below. Then stick around for a quick guide to buying a gift for a guitarist and what to look out for. Note that, as the range of ideas that we feature is so wide, the following chart isn’t in any particular order – see this as more of a table of inspiration as opposed to an actual ranking. Also, be aware that we start with the most useful gifts, then move onto the slightly more novelty. A functional set of tools that no guitarist should be without. 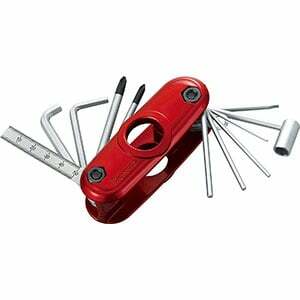 This convenient multi-tool makes a great stocking-filler. Give them the gift of the ultimate guitar protection kit. The height of comfort from this premium guitar strap. A string winder and cutter in one convenient tool. This pick set makes a great secret Santa gift! A classy set of exotic wood plectrums. A high-end guitar stand that is perfect for showing off. Give them the gift of plectrums for life! An expensive gig bag, but one they will cherish forever. The luxury gift for the guitarist who has everything. A cool whiskey glass fit for any shredder. The smart gift for the guitarist who likes to cook. This awesome amp-style key holder proves a unique gift. A cool retro clock perfect for a studio/bedroom/man cave. Kicking off this list is a set of essential cleaning and maintenance tools that all keen guitarists should have in their gig bag. While you will find many of these kits on the market, this bundle from Elagon is certainly one of the best in terms of quality, with very reliable tools all packaged into a neat zip-up pouch. These include a set of eight Allen keys, a very good string winder and bridge pin puller tool, a string-cutting pliers, and a string cleaner stick, as well as guitar polish and a polish cloth. Created by Ibanez – a brand that knows a thing or two about epic electric guitars – the MTZ11 is the Swiss Army Knife for guitarists. At under twenty bucks, this multi-purpose tool combines all the necessary gadgets a guitarist would need for setting up their guitar. This includes six easily-accessible hex wrenches, a tube spanner, two phillips-head screwdrivers, and a 50mm ruler, all of which neatly slide away into a small red case that would fit any guitar bag (or pocket for that matter). One of those ‘must-haves’ for any guitarist. 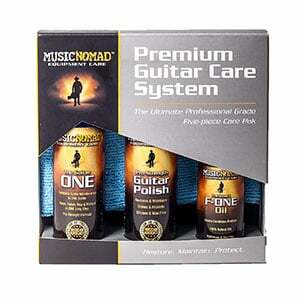 All guitarists care for their guitars – so, if you want to care for your guitarist, this guitar care kit from Music Nomad is a very sensible gift! The five-piece bundle offers guitarists all they need to keep their prize axe in tiptop condition. The kit comprises a bottle of all-in-one cleaner, polish and wax for everyday cleaning, and another bottle of polish to safely bring some zest back to lifeless guitar finishes. A smaller bottle of fretboard oil is included to maintain beautiful fretboards. This affordable kit also includes two good-quality microfiber towels. We included this awesome premium strap from KLIQ at the top of our chart on the best guitar straps – and it would make an excellent gift. 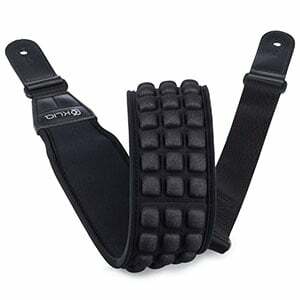 With full adjustability (from 46” to 56”), this strap makes use of an innovative 3” wide neoprene shoulder pad featuring several rows of individual soft ‘air cells’, that help evenly disperse the weight of the guitar. This ensures it is incredibly comfortable for any guitarist, no matter what they play. Trust us – they will thank you every time they slip it over their shoulder! If you are looking for a gift on a budget, this Pro Winder from Planet Waves is an excellent choice, hitting the shelves at just over ten bucks. 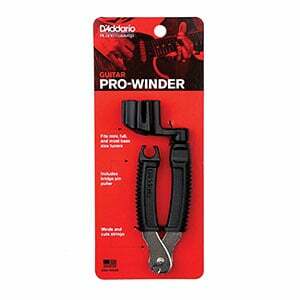 Ultimately a string winder is an essential tool for all guitarists – this Pro Winder just takes things to the next level with additional useful features. In addition to a patented peg winder (which will fit both guitar and most bass tuning keys), you will find a built-in string cutter and a bridge pin puller. It feels robust, looks pretty cool and is easily slipped into any gig bag. Picks are essential to any guitarist, although handing them a single plectrum as a Christmas gift would probably be a bit of a let-down. Handing them this pick set from Pick Geek, however, will result in a lot more kudos for you! This set contains a total of 16 quality durable Delrin picks, with four different thicknesses ranging from light (0.5mm) to extra heavy (1.2mm). 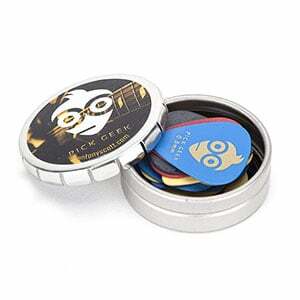 With a range of different colors, these are all neatly stored inside a funky little tin. Note, this set also comes in a jazz variety in addition to regular guitar. While this set comes in at a higher price and with less picks than the set above, Thalia focus on both quality and rarity. Uniquely, these plectrums are made up of micro-thin layers of responsibly-harvested exotic Santos rosewood, which delivers a durable plectrum with a warmer tone than plastic or metal. This set comes in a range of pick flexibilities, but the 0.9mm pack we feature is great for guitarists who like a little more give in their plectrum. The presentation booklet the picks come in make it an excellent gift to open. As featured in our page on the best guitar stands, this beautiful but simple genuine wooden stand from Zither is a great way to show off a guitar and the perfect gift for the serious guitarist. It isn’t cheap, but then its quality is clear to see. With a unique wavy design, this stand is hand-crafted in Brenham, Texas, from premium solid wood (including mahogany, walnut, maple and more) and includes a padded yoke and base strip. With a 38” length this is suitable for all full-size electric and acoustic guitars. We have already offered two excellent pick pack suggestions, but this Guitar Pick Punch from Pick-a-Palooza will allow the guitarist in your life to create their own plectrums out of pretty much any material. For a very reasonable price, this gift pack features the Pick-a-Palooza punch, which is well-made and easy to use, as well as a cool leather pick holder keychain and 15 starter strips. This should be enough to make up to 100 picks, although then you can start recycling other materials to use. It’s the gift that keeps on giving! We had to include this beautiful guitar case from Levy’s Leathers, which topped our chart on the best guitar cases thanks to its huge luxury appeal. This is a serious gift – it comes with a considerable price tag, but it will be well received by any guitarist. 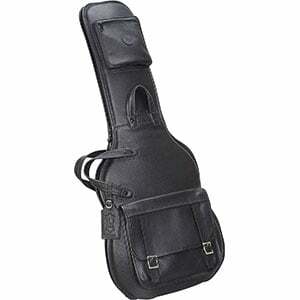 Suitable for a full-size electric guitar, this well-padded case features a soft genuine leather outer which both looks sophisticated and feels delightful, along with a protective plush interior lining. It comes with two exterior pockets for accessories, along with extra padding for the headstock and bridge. While buying someone a full Marshall stack is probably a bit too generous for a casual Christmas gift, buying them a Marshall stack fridge is an epic present indeed! Standing just over 30” tall and featuring a cool blue interior light, this bar fridge stores a hefty amount when full, including 35 small cans and four bottles of wine. The door design features the same components used on a genuine Marshall amp, so it looks authentic and is an instant talking point at any party. A solid choice for the guitarist who has everything. Guitar and whiskey go together like… well, guitar and whiskey. It’s a match made in heaven! Which is why this special whiskey glass makes an excellent gift for the guitarist who enjoys a dram. This fully-functional handblown glass features a real plectrum (with the choice of either blue, grey, purple or red) embedded into the side of the vessel. It looks great on any shelf, sits nicely in the hand and can cope with a generous serving of whiskey (or milk, for the morning after…). Coming in at under $20 it makes a great stocking-filler. Whether the intended recipient is an avid cook – or just prefers to serve salad with a spoon instead of their hands – this utensil set makes a solid gift. Made of heat, stain and odor-resistant bamboo, this four-piece set comprises a spoon, a fork and two spatulas, all with Strat-style guitar neck-shaped handles, complete with headstock. The utensils are 11.75” long, making them useful for most kitchen tasks, while the no-splinter design ensures they are safe to use. The added bonus is that they come in a giftbox that looks like a guitar case! If you are looking for something particularly unique, this awesome key holder from DropLight Ind. takes some beating. It features an authentically-styled amp face wall hanger that holds four 1/4” jack keychains (included in the price) – these are a cool enough gift on their own. 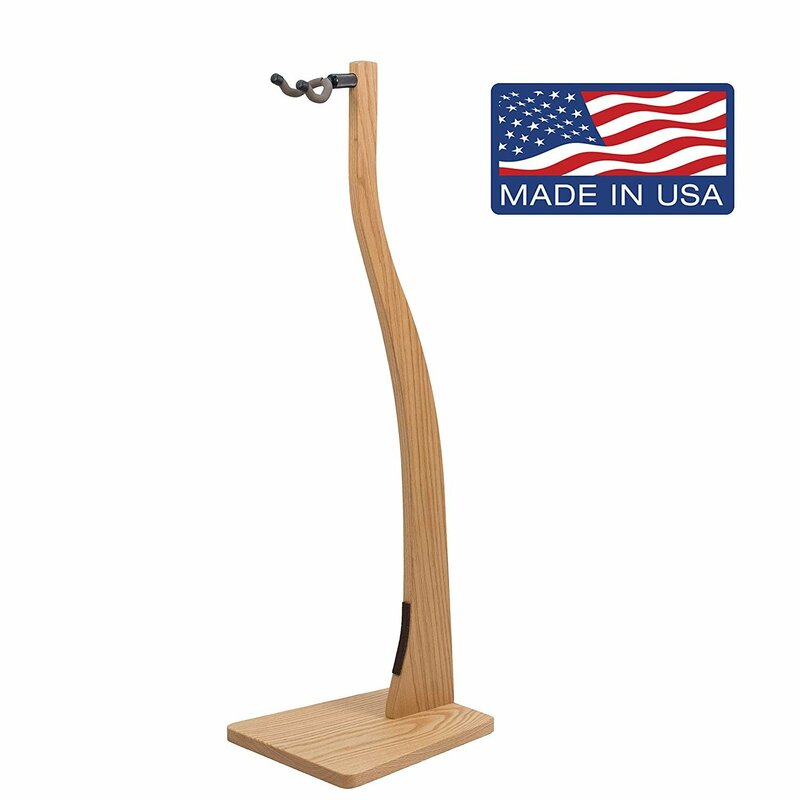 Handmade in America, the quality and designs are great, especially as it features an LED-powered jewel lamp for added authenticity. Several designs are on offer, including faces styled on Marshall, Vox and Orange amps. It makes hanging your keys a genuine pleasure! Whether they need a timepiece for a bedroom, studio or mancave, this retro Fender clock should hit the spot. This 15” wall clock oozes vintage Americana, with a chrome-style housing featuring a picture of a vintage Fender Strat and combo amp. Adding to the retro charm is a neon red light that glows brightly and looks awesome in a dimly lit room (the clock itself only requires two AA batteries, but the light needs mains power). Of course, as well as looking great, it works well with a smooth, noise-free operation. Whether it’s your mom, dad, brother, sister, son, daughter or even yourself, it doesn’t matter on the age or gender of a guitarist, as most will share the same need for certain items. However, some guitar styles can differ – you wouldn’t want to buy a death metal guitarist a capo or a slide… would you? So, how do you go about choosing a good gift? Firstly, determine whether they play acoustic guitar or electric guitar by either asking them or checking the guitar for yourself. This is important as it will impact the kind of accessories they would need. Acoustic guitarists may want accessories such as a capo (which changes the pitch of the strings) or a slide (which allows them to play blues-slide guitar). Electric guitarists may want a new quality cable to enhance their amplifier tone, a new effects pedal, or even a headphone amp (allowing them to practice quietly). While there are major differences, all guitarists would happily receive general items such as strings, tuners, cases, straps, cleaning and maintenance products, plectrums, guitar books and stands. Just be aware that some of these may need further input from the recipient (i.e. string gauges and materials differ greatly and certain guitarists prefer certain styles). Also, be aware that if they are a keen guitarist, chances are they already own some accessories. This is where novelty items come in, such as the Marshall fridge on our chart. Even if they have been playing guitar for decades, not everybody would have a bar fridge shaped like an amp! So, sticking to novelty gifts can be a good idea if you are not sure. If you really want to nail the gift, ask them exactly what they want! It is easy to go wrong with a gift for a guitarist, but if you do a little research it is also easy to get it right! We hope our chart has given you a little inspiration when shopping, although there are hundreds of other gifts available – so get browsing. Good luck!